Duration: 3 mins, 56 sec. Score: Impromptu : for piano op. 9 / Julian Yu. 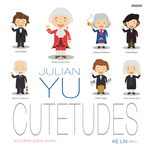 CD: Cutetudes : and other piano works / composer: Julian Yu ; Ke Lin piano.